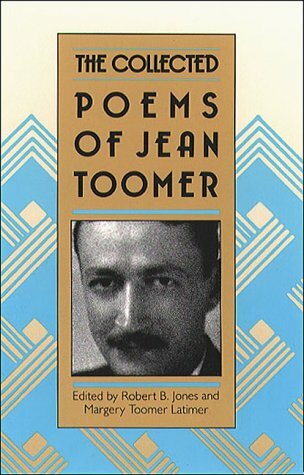 A while ago I read Jean Toomer’s slim work of uncategorizable literature, Cane (1923). As well as being one of the peaks of American Modernism, it single-handedly raised my interest in the Harlem Renaissance. I read it twice, raved about it, used it to help kickstart this blog and was pleased as punch to receive this collection of his poetry (the first ever compiled, edited and introduced by Robert B. Jones for Chapel Hill/University of North Carolina Press in 1988) as a gift last year. Pieces now the wind may wear. Among the highlights are the playful linguistic riffs he made on the elements, defining the character of ‘Air’ as I’ll try anything once or that of ‘Water’ as Saved from monotony by the ripples and currents of its flow. The first genuinely Toomeresque poems from this era had a tendency to be recycled and put into Cane. Tender love poems such as ‘Evening Song’ and ‘Her Lips Are Copper Wire,’ the latter beginning with layers of formal image metaphors before the austere heart is revealed: then with your tongue remove the tape / and press your lips to mine / till they are incandescent. ‘Face’ uses the same tactic, building an old woman’s portrait in metaphors beginning in beauty – her gray hair like streams of stars – only to reveal the horror of her pain and exhaustion and looming death as it proceeds. 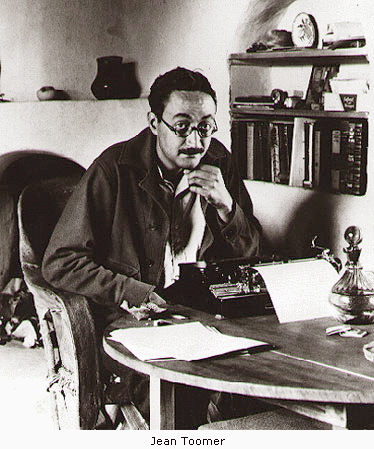 From 1921 to 1923, Toomer’s focus was on the African-American experience, his stance that of a literary anthropologist. Well-educated and of mixed heritage, he felt himself an outsider among both black and white. His poems here based on folk song, or focused upon the conversion from pagan culture to Christian, and the image of the harvester predominates. The poems in this brief era are most likely going to be familiar to any who read this book and so the meat of new discovery comes in what are here labeled the Objective Consciousness period (from 1924 to 1939) and the Christian Existential period (1940 to 1955). Post-Cane, Toomer lost interest in pursuing a literary career and only published an occasional poem. In his Objective Consciousness phase he found inspiration in the tenets of Gurdjieffian spiritualism. Jones, in his introduction, calls it an arcane and obscure philosophy and Toomer channeled it into several dense works, his themes now of transience and transcendence. The “centerpiece” of this time would technically be ‘The Blue Meridian,’ a 25-page epic of spiritual America which owes its existence to Whitman and naturally put me in mind of some of the Beat epics. And while it’s not going to be replacing ‘Howl’ and ‘I Am Waiting’ on my spiritual American roadmap, in several of the smaller poems he crafted absolute gems. That’s one called ‘Unsuspecting.’ Equally enjoyable is ‘The Gods Are Here,’ wherein he sets forth that one has no need of primordial isolation or a hermetic wilderness to reach the Gods, that in a thoroughly banal landscape he knows that if I touch them / I will arise / and take majesty into the kitchen. Last in chronology are the Quaker religious poems of his final years, better described as prayers. I have a small but growing interest in the Quakers due to the guiding light of Charles W. Eliot’s Five-Foot Shelf. For all their good points, the Quakers don’t encourage eclecticism. Toomer’s last set are all on the solitary topic of faith and the way to God, with the exception of ‘To Gurdjieff Dying,’ a bizarre insult in code to his former mentor. Coiled as a serpent round the phallic Tau / and sacramental loaf is an interesting thing to say but makes scarce sense to the non-specialist. None of these late era poems do much aesthetically, wholly reliant upon their spiritual purpose to make an impact. Though not memorable on their own, they make a heartfelt conclusion in the context of this book. That as broken instrument / I may be mended, as an agent / to do Thy Will towards man, / And the awakening of kinsmen. This is entirely consistent with the visions of Woolman and Penn. It is their spiritualism wrapped in a poem. Jean Toomer’s an excellent, underrated writer. If you haven’t read him, start with Cane. If you still want more, this little book is ideal and you should seek it out.